Using his home building expertise, Brian Bosgraaf started Cottage Home in 2000 specializing in building custom homes along Lake Michigan. Cottage Home has designed and built more than 70 custom homes along the West Michigan shoreline, including 13 LEED certified homes. In an interview with Brian, he expressed his passion for LEED certification and sustainable construction practices. When Brian and Jeremy vanEyk (Vice President) were asked about their commitment to building LEED, they responded that Cottage Home is committed to utilizing healthy, affordable, efficient, and durable construction practices that are already above code, energy star and even LEED at times. Brian says he considers LEED only one of the many tools in his toolbox. Other such tools include creative design, customer service, careful selection of materials, and creating a sense of place. In order to make it simple for the customer, Cottage Home uses a fixed price prior to starting construction which already includes LEED qualifications. This allows some of the cost of LEED certification to be absorbed by both the customer and through the Cottage Homes marketing budget. Brian believes this method works due to his design and construction teams working together throughout the construction process, which creates a feedback loop that fosters constant improvement. 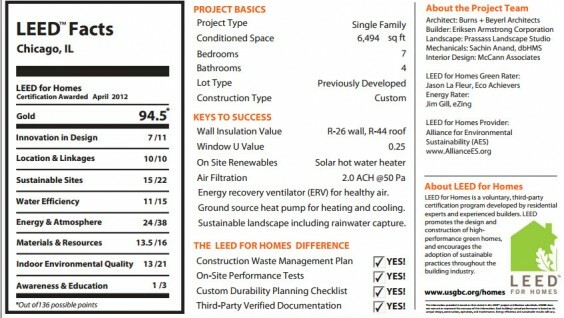 Including LEED certification into the final cost helps facilitate more sales than presenting each option with separate pricing. Since many homeowners today are educated and concerned about sustainability and environmental issues, many take time to study the details of LEED on the website of Cottage Home and take comfort in knowing LEED is a third party certification. 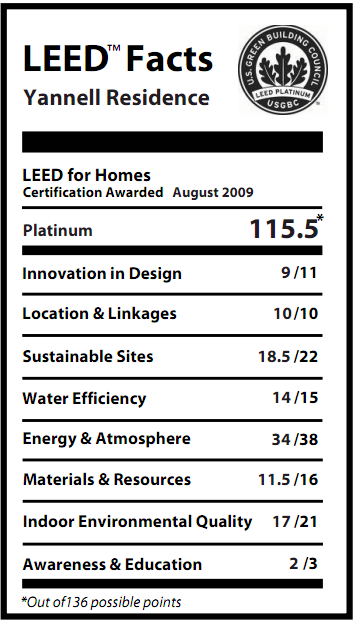 Clients are aware of LEED’s achievements and credibility, and often wonder about how changes to the house affect the LEED certification level. Much of Cottage Home’s customer base is from the Chicago area where LEED is prevalent in their office buildings, and a result, many clients have experienced the advantages offered by LEED construction firsthand. These clients have often already invested in commercial LEED projects and are now ready to transition these same high standards to their personal lives. Jeremy decided to experience the benefits of LEED firsthand and chose to have his own house in Zeeland, certified LEED Platinum. Building on the lake front comes with complications such as extreme wind loads, humid changes, temperature fluctuation, and other variables. To overcome these challenges, Cottage Home uses high performance home measures to control the entire process though design, build, and some maintenance which allows more control of green features. Cottage Home designs and builds what is right for each particular home which may result in homes varying in different HVAC, insulation, passive solar heating, and various climate control systems. One particular feature that is commonly used in these homes, including Jeremys, is an ERV (Energy Recovery Ventilator). An ERV automatically exhausts stale air from the inside of the house and replaces it with fresh air from the outside. Another key feature used in many of the homes is a geothermal system. 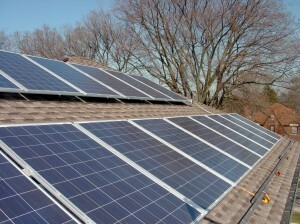 There are a few different types used, but all contribute to the energy efficiency of the homes in some way. Several techniques are used to increase water efficiency in the homes, such as tankless water heaters, which only heat water when necessary, water collection systems to help with sprinking and irrigation, and faucets and showerheads that work with less water than traditional ones. Insulation, as well as materials such as flooring, home furnishings and walls are all aspects that need to be carefully considered when building these homes. As leaders in the industry we asked Brian and Jeremy what they saw in the future of design and construction. Jeremy believes that being able to evaluate the effectiveness of high performance systems and insulation through energy bills is important. Along with water collection systems to reduce storm water runoff and help irrigate the lawn. Brian agrees that we should have a system to allow clients to ensure they are getting the most effective homes. He foresees homes that can be manipulated to meet the client’s needs at any given time. An example of this would be homes with the ability to accommodate a family of four, which can then transition to accommodate sleeping arrangements for twenty. Along with being able to better meet a client’s needs, he would like to see energy loads distributed to only sections of the house in use, as well as the ability for clients to control how energy is used throughout the home (on site and from satellite locations). Cottage Home sees one challenge to moving forward with these ideas is getting sub-contractors to approach basic air sealing, insulation, proper HVAC sizing, and design aesthetics with an effective mindset. Cottage Home has established themselves as innovators and leaders in the design of luxury LEED lake front homes. They continue to partner quality, design and the environment hand in hand to produce sustainability along our beaches. Learn & see more about their LEED projects below. Beach House on Monroe Blvd. 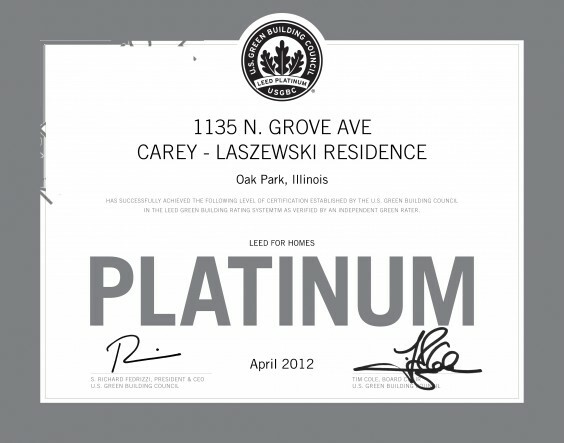 The home at 1135 North Grove has earned LEED Platinum certification by the U.S. Green Building Council (USGBC) for achievement in green homebuilding and design. It will be the first residence in Oak Park to receive LEED certification, and this new custom home was built for less than $150 per square foot. 1135 North Grove is one of 40 homes in Chicagoland that have been certified using LEED (view the LEED Project Profile). The single-family home was built by Wicklow Development Group, renowned for their expertise in green building and historic preservation. Through their commitment to green homebuilding, Wicklow Development Group is helping to keep homeownership affordable. Green homes have substantially lower utility bills and may qualify for advantageous financing, lower insurance rates and government incentives. “As a LEED Platinum home, 1135 North Grove is at the national forefront of green homes, and serves as a model of healthy and efficient living for the entire community,” said Jason La Fleur, Regional Director for the Green Home Institute, who also served as the third-party verifier for the project. “Their example can help us all to live better by reducing our environmental footprint, cutting the costs of our utility bills, and coming home to a healthier place to live.” La Fleur is hosting a free webinar on May 9 for real estate professionals interested in learning more about LEED homes. 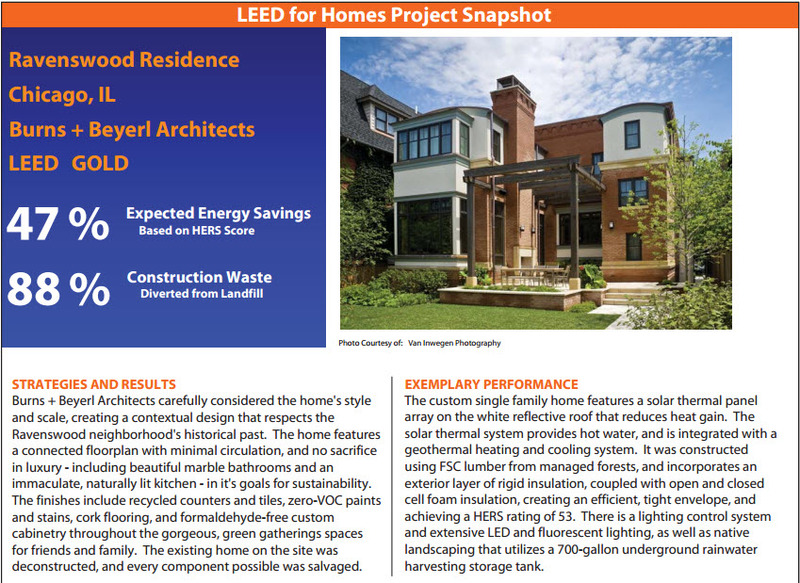 1135 North Grove reduces energy use 66% below the typical new home built to code. The four bedroom project features low-e argon windows, high efficiency lighting fixtures, detailed attention to preventing air leakage, and blown-in fiberglass insulation. Other energy efficiency upgrades include a geothermal heating system which also provides most hot water heat, and a rarely-used backup electric water heater. An ultra-efficient electric induction cooktop is used in the kitchen. The roof angle was optimized for solar panels which produce electricity to power the home, without visually disturbing the home’s facade. Located in one of the “Top 10 Neighborhoods in the Nation” according to the American Planning Association, the home features a very walk-friendly location in the heart of a neighborhood with many historic homes designed by notable architects. As a result of incorporating energy saving products and technologies, 1135 North Grove has achieved an impressively low 34 Home Energy Rating System (HERS) score. Additionally, the combination of electric using-and-producing systems at 1135 North Grove has resulted in affordable energy bills for the homeowners who have been living in the home for a full year. The house has had modestly low electricity bills, and as an all-electric home no natural gas is used, so there are no natural gas bills. A heat recovery ventilator provides fresh air distributed throughout the home to keep it healthy for the homeowners and recovering some of the energy used to condition the air. Low VOC (volatile organic compounds) paint and locally sourced materials have been used throughout the house. 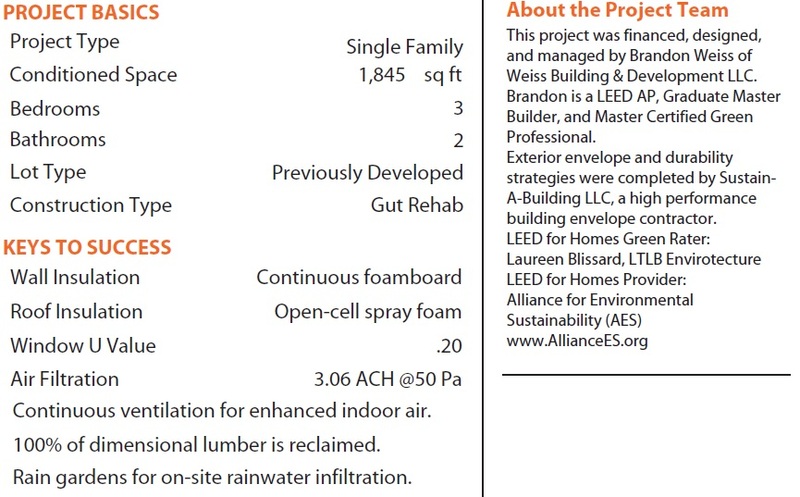 Proving building green can be done affordably, 1135 North Grove was built with a total construction cost of $145 per square foot after renewable energy incentives, below the Chicagoland average construction cost for custom new homes. Learn more and see construction photos at the project web site for 1135 North Grove, or view theLEED Project Profile for the home. 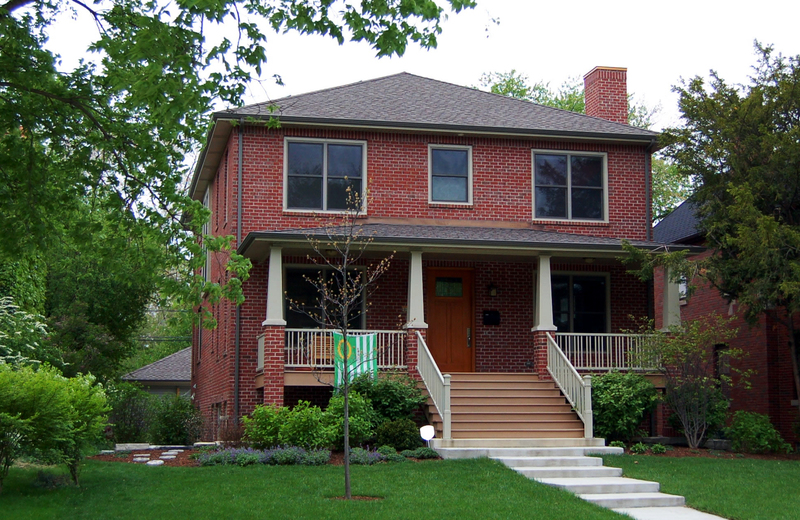 The Wicklow Development Group LLC are landmark building and restoration professionals, and have been a Chicagoland builder for over 25 years with a passion for historic preservation and green building expertise. 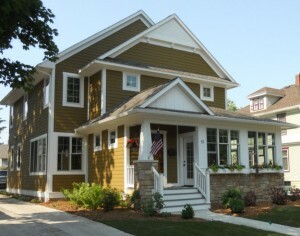 For more information, contact Paul Wicklow 708-351-9683, or visitwww.wicklowdevelopmentgroup.com/greenhome. The goal of this home was to take a foreclosed home in disrepair and turn it into a high performance, healthy, utility efficient, environmentally responsible, and very durable home. Durability planning was used in conjunction with building science flashings and maintenance free exterior materials with lifetime warranties. The energy efficiency was improved by almost 300% on this home with air sealing, wall cavity insulation, exterior insulation, and windows with a .20 u factor. All materials used were non- toxic, low VOC, and had no added urea formaldehyde. This home received two exemplary performance credits for MR 2.2. This was due to many extra points in that category for a high level of reclaimed materials usage, the use of locally produced products, and the use of low emitting products. All lumber used for framing in this house was reclaimed lumber. 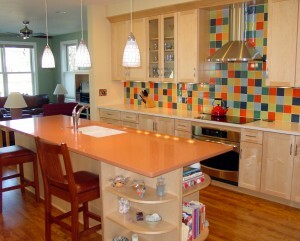 This remodel was done as an investment property, rehabbed and turned over and placed on the market for sale. The sales prices was comparable to other rehabbed homes in the local market. Construction costs on this project were impressively low at $55.00 per square foot. 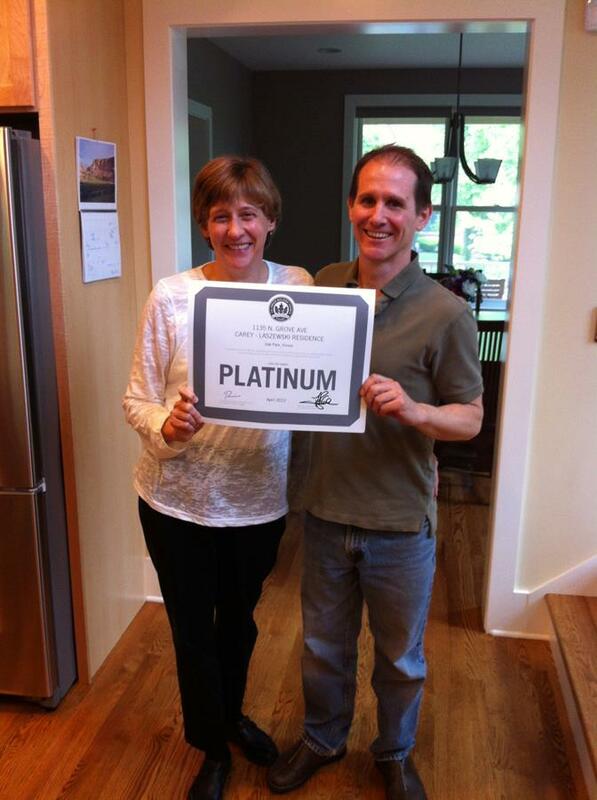 This project was featured in the Chicago Tribune, Exerpt below. Few homebuilding materials can’t be reused or recycled, said Brandon Weiss, president and owner of Elgin-based Weiss Building, who recently salvaged 99 percent of the material from a four-bedroom, two-bath home he rehabbed in Elgin. “Everything that could get a second life, I donated,” said Weiss, who has become somewhat of an expert at reusing construction leftovers, filling in old crawl spaces with leftover bricks and using stones as landscaping accents. Homeowners who are planning a construction project should know that many waste companies can recycle discarded materials from trash containers and will prepare a report on the percentage of materials they are able to divert from landfills, said Jason LaFleur, regional director of the nonprofit Green Home Institute. “If they can’t provide the service, you might want to think about going with someone else,” he said. The total cost was $1.6 million. That may seem like a lot of money, but if you look at any other custom-built house this big—it’s 2,675 square feet on a double lot in Chicago—it’s going to cost at least that much. Incidentally, the green materials generally were no more expensive than conventional alternatives. 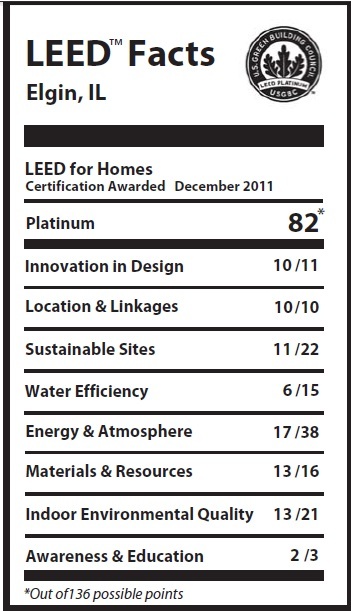 ELLE DECOR: Why did you decide to build a LEED platinum house? MICHAEL YANNELL: I wanted to set an example. I had been very frustrated with the construction I was seeing in Chicago. There are so many green options, but nobody was using them. People assume it’s too cold, it’s too cloudy, for solar energy. I wanted to show it could be done here. ED: So it’s a kind of demonstration house? MY: I’m not saying every house should be like mine. I’m saying, look at my house, take one detail, and start there. ED: To accomplish that, you have to be willing to let the world see how you live. MY: After I moved in I began giving tours constantly—usually an hour long, and limited to ten people, because there were always lots of questions. We started outside the house, and I explained the macro design of the home and then went room by room. I think people have been surprised by how beautiful the house is on the inside. I don’t know what they were expecting. ED: So, give us the tour. MY: The house is divided into two wings, so every room has a southern exposure. I think that’s a huge benefit, to not have any room be always dark. I never have to turn a light on during the day. In the winter months, it really has a beneficial psychological effect. The north side, by contrast, has only a few small windows—you’d lose too much heat otherwise. ED: The solar panels all face south. MY: Yes. But it doesn’t jump out as a house with solar tacked onto it. One of the things the architects insisted on was having as many of the solar panels hidden from view as possible. That’s one of the reasons the roof has that V shape. All the panels are on the north side of the V, and the south side of the V hides them from sight. ED: How much did all this cost? MY: The total cost was $1.6 million. That may seem like a lot of money, but if you look at any other custom-built house this big—it’s 2,675 square feet on a double lot in Chicago—it’s going to cost at least that much. Incidentally, the green materials generally were no more expensive than conventional alternatives. The big items were the heating and cooling systems. But you can take tax credits for 30 percent of those. So basically I won’t owe income tax for the next few years. ED: How did you choose the finishes? MY: Every material that went into the house has some environmental story. The exterior is a combination of durable fiber-cement board and Forest Stewardship Council–certified cedar, covered in a cocoa soy-based stain. I love the contrast of dark and light. 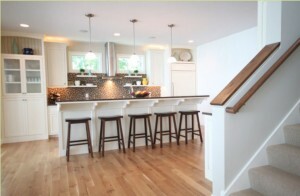 ED: And the interior finishes? MY: In the south wing the floors are a dark brown recycled-porcelain tile, which is very earthy, very soft. In the north wing the floors are made from scrap lumber, which would have ended up in a landfill. It’s walnut, with a clear coat that gives it a warm, natural feel. In the bedrooms, I chose dyed-clay walls. Besides looking good, they absorb sound better than regular painted walls. And clay also absorbs humidity, which is a nice feature in the summer. ED: Does the furniture have the same kind of environmental credibility? MY: Much of it is steel, which is recyclable. That’s one of the reasons we bought a lot of furniture from Knoll. The house has a midcentury look, so Knoll was right up our alley. All of the fabrics are Greenguard certified. ED: What about the art? MY: We chose the work of a Venezuelan artist, Radames, who works with Plexiglas scraps. I liked the designs, but I don’t like Plexiglas, because it has a high petroleum content. So we asked if he could work with 3form, which is an eco-resin product. He came up with seven or eight pieces for inside and a sculpture for the backyard, so it’s a green art collection as well. ED: Speaking of art, the house has gallery reveals—those subtle recesses where the walls meet the windows and door frames. MY: We used reveals throughout the house. I had never even heard the term before. It became known as the “R-word” during the design phase. It added to the cost, but it was really important to the architects. I have to admit, I appreciate how good it looks. 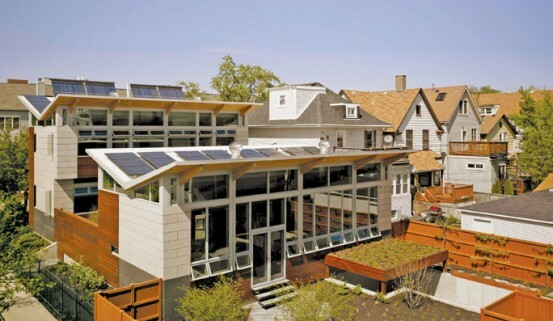 Architect Jonathan Boyer, of Chicago’s Farr Assoc., says the house is designed to produce as much energy as it consumes. But, he adds, he knew it would get the point across only if it also looked good. • Be flexible: Most of the materials were produced locally—a key green principle—but when he needed an attractive cement board, Boyer had to buy a European product. • Do double duty: The butterfly roof provides shading in summer and optimal placement for the solar panels. The V shape collects rainwater, which is used for irrigation. 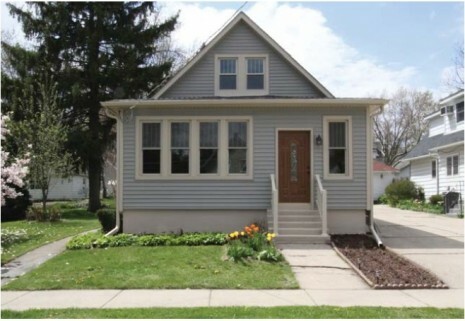 Also featured is an affordable green home remodel selling for $150,000. View details and the photo tour at the Chicago Magazine online blog. Chicago’s green consumer magazine, Mindful Metropolis, released their January issue with an article focusing on the first prefabricated LEED home in the city of Chicago. The project, which toured in December, is the focus of a two-page cover story discussing the evolution of prefab homes as an affordable green alternative. The magazine has an interview with the architecture team of Jeff Sommers and Kate Votava, of Square Root Architecture, and their plan to replicate prefab homes across Chicagoland. Download the full article. Another Chicago project was recently in the news, filmed by the ABC (Channel 7) News team. Tom McGrath’s Elemental Building is a gut-rehab project transformed into a high-end LEED Platinum home right in the heart of Bucktown. The project’s first move was to build a solar garage that could provide power for the construction team, and has some innovative reuse of materials. Watch the video. Have a newsworthy project you’re working on? Be sure you’re on our Project List page and send us information.